I started working with OAF in 2015 as a Spanish teacher for the preschool program at Centro Escolar Bilingue Santa Clara (CEBSC, our bilingual elementary school). How did you find about the Olancho Aid Foundation? Many years ago because my little brother and some cousins were enrolled at CEBSC. Seeing the quality of work at that time was a motivation for me to become a part of the Foundation. I went to Tegucigalpa for four years to study at UPNFM where I received a Bachelor’s Degree in Preschool Education. 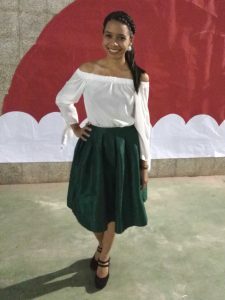 After graduating, I came back to Juticalpa and submitted my resume to OAF, and I was so happy when I received a call to interview with the Foundation. After speaking with the person in charge, I was chosen a Kindergarten teacher. It has been a blessing for me and I’m so thankful to God for allowing me to be part of the Santa Clara family. I’m a teacher at CEBSC. I’m in charge of Spanish classes for both sections of preschool and all three sections of Kindergarten. For almost three years I’ve had the opportunity to work in preschool with the goal of educating each child doing different activities so that the students learn best. I always practice a constructivist method, using fun, dancing, and singing, and I always work on building a good relationship with my students. How has your role at Olancho Aid changed? So many things have changed during my years of service, especially the way of teaching in the classroom. Every year I realize the importance of an education based on significant learning and to achieve it I have to keep improving my strategies. It has also changed my way of thinking and acting toward the students; I want to be a teacher who positively influences the lives of her students and for them to grow up remembering the values they’ve learned in class and be strengthened as good men and women. What I like most about my job, and I can say this with certainty, is being with the children. God has placed in me this vocation to spend my time serving Him through the children and I thank Him for this opportunity. Working with children is something special and indescribable, everyday the little ones fill me with joy, laughter, hugs, but above all, seeing daily progress in their learning makes me feel proud of my work and responsible and committed to the innovation of new activities for my students. I would describe them as happy, full of life, clever, and above all they are intelligent, respectful, attentive kids; they have been learning and developing but they’re also so full of love. I like to dance and play soccer. I really enjoy going to the stadium to support Juticalpa FC. I’m also a happy, God-fearing person. I like to be with friends and meet new people. It’s also a pleasure to have time with my family and visit new places. I really enjoy helping others.